Number 1 on the list of greatest live acts now is a 63-year old legend who could coast on his reputation and still make this list. Yet, Bruce Springsteen plays with the urgency of an unknown act trying to prove himself. He continues to give everything he has onstage (in Finland, he played for 4 hours and 16 minutes, his longest show ever). He abandons his set list to play requests from the audience, which keeps his band from falling into a rut. He commands the stage. After all these years, he’s not simply “doing well for an older rocker” — he’s setting the standard for excellence, period. Another well-established act, Radiohead, “refuse to rest on nostalgia,” in the words of Rolling Stone, with the band members challenging themselves to bring fresh material with each tour. 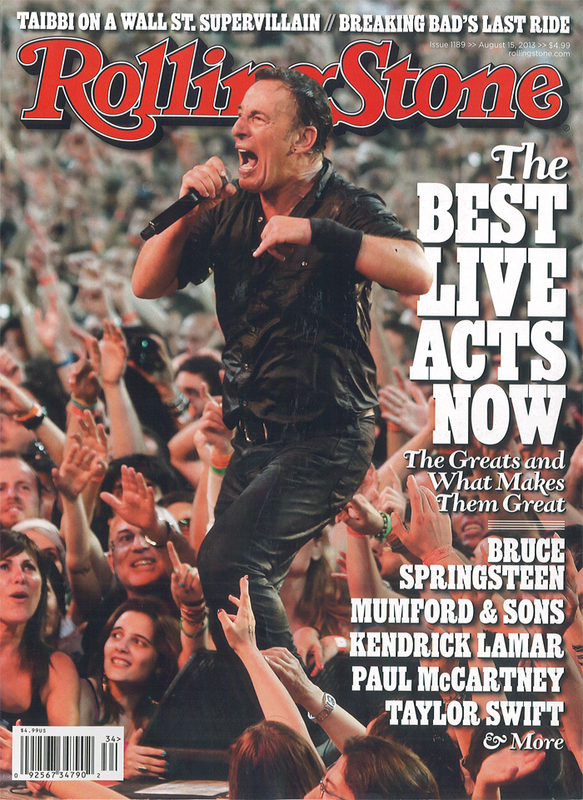 But Bruce Springsteen is the one artist who exemplifies all five lessons on this list. The artists, critics, and industry types who selected the Top 50 laud Jay Z for making “personal connection with the audience at every show.” Similarly, U2 “have this ability to create intimacy” even in large arenas, according to Lars Ulrich of Metallica. “It always feels like it’s just you and the band,” he says. Green Day takes audience intimacy to another level by involving the audience: Billie Joe Armstrong brings a fan onstage every night to play guitar. There is a time to create intimacy — and then there are times when you need to simply awe your audience by providing an engaging experience. The Nine Inch Nails create an experience, not just a song. As Rolling Stone notes of a recent show, “sculpted sonic darkness, the sensory-attack light show and [Trent] Reznor’s doom-diva charisma were breathtaking.” Muse also earns praise for its inventive set designs. Madonna enriches her music by “combining the precision of a Broadway spectacular with the theatricality of an action flick and the raunchiness of a burlesque show.” Lady Gaga “never stops thinking big: huge sets, massive choreography, epic speeches about overcoming obstacles.” Intimate? Maybe not. But memorable and engaging? Absolutely. The great bands are anything but predictable. Wilco can rely on an impressive catalog of songs, yet you never know what the band will play on any given night (and Jay Z also receives props for never performing the same show twice). Pearl Jam receive high marks because “[a]fter more than twenty years, the grandmasters of grunge are still bursting with surprises, mixing their world-beating anthems with rare cuts and covers.” But surprise and delight can occur in smaller ways, too: both Mumford & Sons and the National provide unexpected musical touches such as a horn section onstage. All the bands on this list have something in common: they give a damn about what they do. The top acts know you paid a premium to see them and that you’re probably watching their every move for the time you spend with them. For Brittany Howard of the Alabama Shakes, passion is evident in her powerful voice. Jack White and Prince bleed passion through their guitars. Sounds a little obvious, right? But don’t you wish that every airline showed you the kind of passion and commitment after you forked over hundreds of dollars to be with them? What kind of experience do you want to provide your customers: over-the-top engagement a la Lady Gaga, the surprise and delight of Wilco, or perhaps the intimacy of Jay Z? The answer starts not with your customers, ironically, but with you and your brand. What do you stand for? What’s your personality? You better believe the Top 50 live acts understand themselves and what they promise their fans. And then they deliver on their promises to create great experiences. This entry was posted in Music and tagged Alabama Shakes, Billie Jo Armstrong, Brittany Howard, Bruce Springsteen, David Deal, Green Day, Jack White, Jay-Z, Lady Gaga, Madonna, Mumford & Sons, National, Nine Inch Nails, Pearl Jam, Prince, Radiohead, Rolling Stone, Superhype, Trent Reznor, U2, Wilco. Bookmark the permalink.